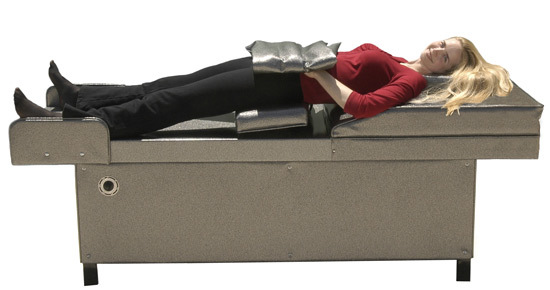 Two positions benefit patients on the Sandbag Machine. Two pads move alternately in an inferior and superior direction under the buttocks, while the trunk remains fairly stable. The patient lies supine, with hips at the top of the pads. Hands are clasped just below the rib cage, with a ten pound sandbag placed on top to secure them in position. The patient experiences superior and inferior movements of his/her lower extremities in relation to the pelvis for an imitation gait pattern. The two pads are under the scapulae moving back and forth in a rocking motion, while the lower extremities remain stationary. The patient lies supine with scapulas on top of the two moving pads. The head is supported on the cushion while the buttocks and lower extremities lie stationary on the stable section of the machine. The patient will develop increased upper back extension, as well as increased movement of the scapulae in relation to the spine.